Fresh Farm’s has 11 summer market’s in the DMV area. I am lucky enough to live walking distance to the Sunday Dupont Circle market. The market is open year round, but the summer produce this year has my heart! Today’s recipe features beautiful and funky summer squash, the best summer corn, and cute micro greens, all of which is available at the market. 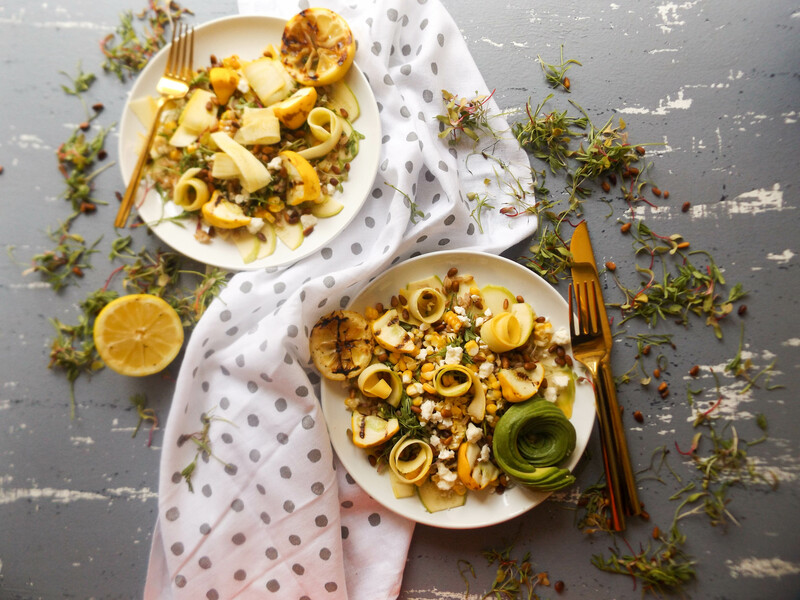 The summer squash is featured both raw and grilled, which in my opinion is really the best of both worlds. For those of you who are new to my blog, most of my recipes are designed for one or two people. This salad is measured out for one, but can easily be double tripled etc. I would love to know what you think of this salad! Please leave a comment below! Preheat the oven to 350 degrees Fahrenheit. Add the pine nuts and cook for only 5 minutes. Using a mandolin, thinly slice about half the summer squash. Cut the other half of the squash into cubes and grill it on a grill pan. (This will depend based on the shape of your squash). Add the corn to the grill pan. Grill for 6-8 minutes. Cut off the cob. In a small pot, add the 1/4 cup of farro and 1/2 a cup of water. Cover the pot. Mix every few minutes until all the water dissolves. If you wish, make the avocado rose. Use half the avocado, remove the pit and the skin. Thinly slice it the long way. Then start to push the slices up so that they fan out in a line. Slowly, turn the one side of the avocado into a circle to form a rose. Note: you can totally skip this step and cut the avocado however you would like. Assemble the salad. Lay out some of the thinly sliced raw squash. Add grilled corn, farro, micro greens and feta on top of the squash. Then roll some of the thinly sliced squash slices and add them to the salad. Add the avocado rose on top if you wish. Juice the lemon into a jar. Mince the garlic into a jar. Add the olive oil, vinegar, and maple syrup. Add the cover to the jar and shake well.